This is one of the cooler things I’ve seen on the Internet lately. 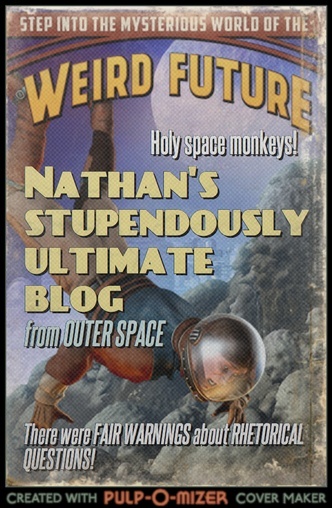 Make your own pulp magazine cover! What an utterly glorious time-sink! I discovered this a couple of weeks ago — and was obsessed for an entire weekend. Thanks! Have two short stories that I can definitely use this for. I so have to do this! Woah, very cool. @ Neil – what a great idea – using this for covers! Neat. So, Nathan, I finished!!! What a terrific book! 😀 You have such a wonderful voice – witty, and funny and accessible. I was surprised by some of the turns the story took, loved the crackerjack pace and it got very wise there at the end. Some real depth. I did wonder, though – are you setting it up for a sequel? I hope so!!! I want to read more, and Jacob needs to go out into space again!! Thanks, Mira! Nope, I'm thinking it's just going to be the three, I'm going to be moving on to new things. Really glad you enjoyed it.